Yesterday we took a FirstLook at the A/C PRO recharger from IDQ. After consulting Bentley’s Boxster Service Manual and Wayne Dempsey’s 101 Projects for the Porsche Boxster , we felt we could easily tackle this project. Today, we are going to see if recharging the A/C system of our Porsche Boxster will bring back the chill. The various air conditioning components (compressor, temperature sensor, evaporator, etc) are distributed throughout the car. Some of the components, such as the blower and the compressor, can be difficult to get at. 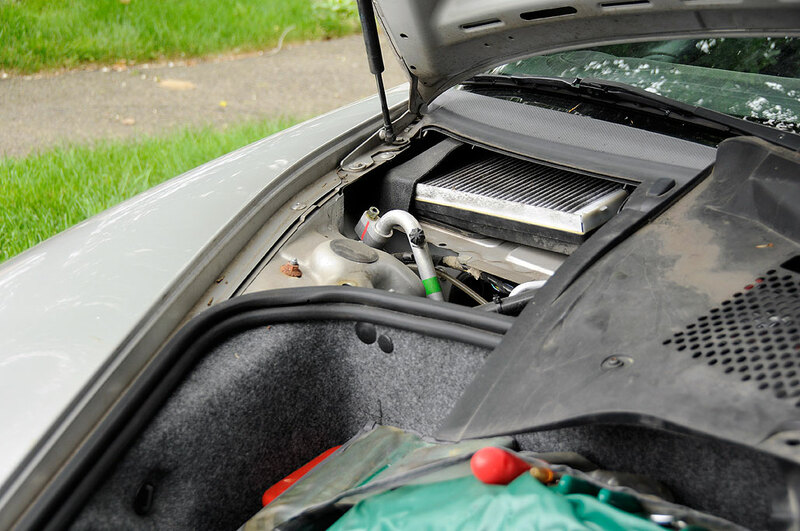 Fortunately, the refrigerant connectionsare conveniently located under the cowl on the passenger side. There are two different ports. They are usually coverd by black twist-off covers. One is for adding refrigerant, the other one is for checking the compressor during diagnostic testing. The adapters are different sizes so it is not possible to accidentally connect to the wrong one. According to Dempsey’s instructions in the 101 Projects for Your Porsche Boxster, the adapter closer to the side of the car is the one we want. To prevent accidental frostbite, the directions recommended that the user wear a pair of leather gloves when handling the hose. As the refrigerant can freeze-burn skin in an instant, we erred on the side of caution and donned an old leather gardening glove. 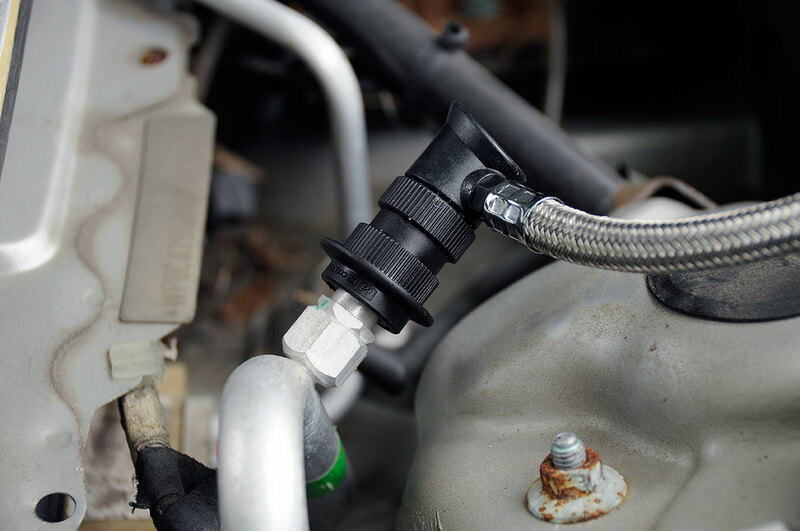 Attaching the hose to the port was simple: just push until it snapped into place. To remove the hose, hold it like a syringe (fingers on the lower lip, thumb on the top) and squeeze together to release. With the cable attached to the port, it was a matter of adding enough refrigerant so the needle moves into the zone between the two red lines on the dial. In our case, we had to give the trigger a few quick squeezes before the needle moved into the zone between the red lines. The whole process took about ten minutes from start to finish. Unfortunately, the air coming out of the vents was still not cold. While the pressure in the A/C system was clearly low at the start, refilling the system with refrigerant did not improve the situation. We will now have to check the other parts of the A/C system to try and find the root cause of the problem. Stay tuned. UPDATE: In being conservative with the adding of the refrigerant, we stopped adding as soon as the needle was in the middle of zone. After talking it over, we believe there was probably not enough refrigerant in the system for the compressor to kick on. Hence, no improvement in the cooling. We did notice that the needle was moving back and forth when we added more. So we went back and continued to add refrigerant whenever the needle began to dip. Eventually, the needle stopped moving and stayed steady. When we checked the air inside the car, the A/C was blowing colder. After emptying the can, we now find that the A/C system is cooling nicely. We will need to check the pressure in a week or two to see if there was any leakage. If not, then we should be good for the Summer!